Katrina's Kreative Heart: Let the Bonuses Begin! Happy Saturday and Happy July! Really, where has this year gone already? Can I just say "WOW"? Stampin' Up! has just announced 2 amazing bonuses! I am just speechless; really, these bonuses, both being offered in the same month no less, are beyond words amazing! And even better, you could take advantage of BOTH! You don't have to choose which bonus you want! Hello! No brainer here....GET BOTH! The first bonus that is in place as of today, is the Bonus Days. For every $50 you spend, you will earn and receive a $5 coupon to be used during August. Now, there is NO LIMIT to the number of coupons you can earn! 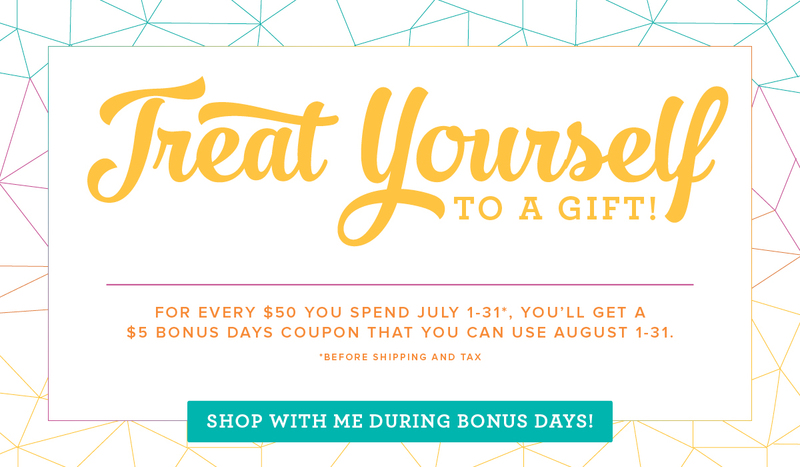 It is for EVERY $50 you spend before shipping and tax, so if you spend $150, not only will you get your $15 Hostess rewards (any product in the catalog up to $15 or Hostess only stamp sets) you will get 3 coupon codes for $5 each for a total of $15 to redeem in August! And here is a little secret for you.....shhhh.....you can't tell anyone.....but Stampin' Up! plans to have an "early release" Christmas bundle August 1st! You would be able to use your coupons toward that AWESOME bundle! Stay tuned for more information on that one coming soon! The second bonus in effect as of today is, the new recruit bonus...this bonus is absolutely AMAZING! We all know that the starter kit is the best deal EVER, but this bonus makes it even more amazing! Talk about speechless! Now, from July 1-July 31, when you choose to get the starter kit for $99 you will get a "starter pack" with all of your essentials! FOR FREE! 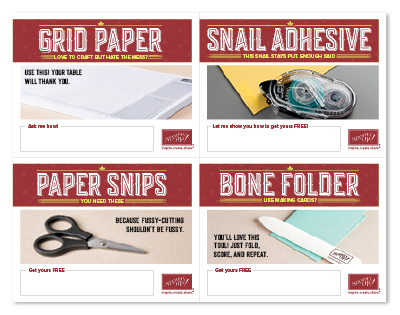 This includes a bone folder, Snail Adhesive, Paper Snips, 2 D Blocks and a pack of Grid Paper! That's an additional $52 value added to your starter kit for FREE! But they didn't stop there! In addition to ALL of that, they are including the brand new, soon to be released Christmas set, Carols of Christmas, another $20 value FREE! Just for trying out the starter kit. More perks for joining: You will get to partake in the early "pre-release" ordering from the Holiday catalog in August (as demo's we get to see and order a full month ahead of our customers, this allows us to get our samples made and play with it and learn about it a full month). You will save between 20-25% on your orders. You will have access to demo only resources such as Demo only Facebook groups, an Online community called Stampin' Connection, a free subscription to the demo Quarterly magazine, Stampin' Success, which is full of ideas and business training. And if you join my team, you will have access to my team Facebook page as well. And here's the deal.....you have NOTHING to lose! The only "requirement" for maintaining your demonstratorship, is you must sell or buy or combination of the two, a total of $300 a quarter...that breaks down to $100 a month! Don't we ALL spend that much or more per month on crafting supplies? Why not do it and save money too? And what if you did take off and have a profitable business? Hmmm, set your own hours to work around your family? That would be nice. Be your own boss? Yep, that would be nice too. Earn a free vacation for you and your family? Yeah, that would be really nice too. It is possible. So think about it.....but again, not necessary...there is no SU police calling you or knocking on your door if you choose not to continue beyond your starter kit. If you never place another order, it's no big deal and NO you do NOT have to send everything back! It's yours, you bought it and you get to keep it! So seriously, if you want the best deal around, this is it all year round, but boy did they sweeten the pot for July! I really hope you consider joining my team. If you have any questions, email me and we can arrange a call to get all your questions answered. If you are ready to jump in, just use the link above. I would love to have you. So, both of these July bonus's are amazing. Will you take advantage of one or BOTH?